Providing you the best range of right angle coupler 4 mm with effective & timely delivery. Our industrial adeptness has made us one of the leading firms, manufacturing high performing Right Angle Coupler 4 mm. 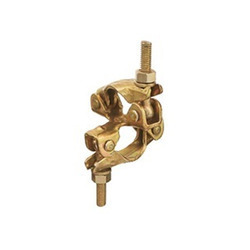 These couplers are widely demanded in scaffolding systems to connect two tubes at right angle. Available in 1/2" BSW Thread x 21mm AF nut size, the offered couplers can be ordered in mild steel or boron steel fabrication as per the application.